Behind a sunny storefront in Newton is Greater Boston’s premier (if not only) Moldovan restaurant. That country is not much bigger than the state of Massachusetts, but offers a more robust culinary heritage. 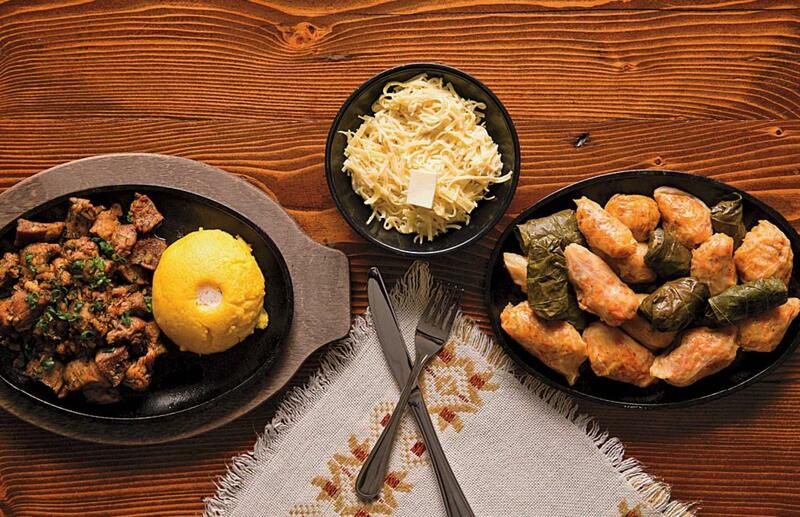 Foods and flavors of neighboring Romania and Ukraine, as well as Turkey and Russia, show up on the menu at the Moldova Authentic Restaurant: lamb kebabs and stewed chicken, cabbage salad, stuffed grape leaves, pickled vegetables, and homemade noodles topped with butter and feta cheese. (Appetizers, $6.45-$11.45; entrées, $16.45-$24.95.) And for dessert? Cherry crêpes topped with whipped cream ($9.95). Owners Artur and Sandra Andronic immigrated to the United States a few years ago, and are keen on cultural exchange. The dining room displays rosy images of Moldovan hills, flowers, and farmland. A black-and-white map of Europe shows the country, shaped like a baby bootie, in red. Some diners may need reminding that the Principality of Moldavia was part of the Ottoman, and then the Russian, empires, but that Moldova (the poorest nation in the European Union) was established in 1991 upon the dissolution of the USSR. The restaurant fits right in with the Nonantum neighborhood’s mix of unique stores. Before eating, check out the modern home accouterments at Greentail Table, the perfumes, soaps, and mustache wax at Colonial Drug (the relocated Harvard Square mainstay), and the cream puffs at Antoine’s Pastry Shop. Moldova is open all day. On a winter afternoon, housemade fruit punch, coffee drinks, or a glass of wine or beer pairs well with any of the appetizers—chicken and mushroom crêpes, chicken noodle soup—or try the traditional plăcinte la tigale (pan-fried pie) stuffed with apples: all evidence that big tastes turn up even in small places.